This entry was posted on September 17, 2015 at 8:12 am and is filed under Documentary. You can follow any responses to this entry through the RSS 2.0 feed. You can leave a response, or trackback from your own site. Alex Gibney also made a doocumentary about the dark side of the Church of Scientology. A busy man to say the least. Yes. Going Clear: Scientology and the Prison of Belief. An interesting companion piece to the “cult” of Apple. Nice post. 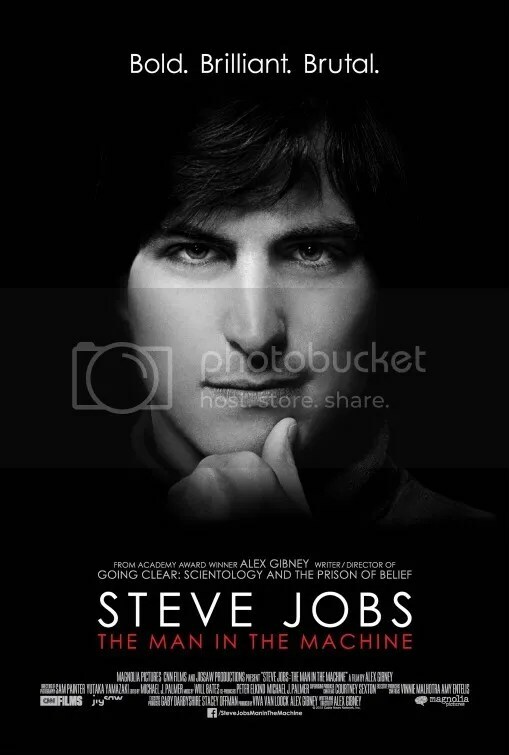 Jobs doesn’t surprise me, sounds similar to the Social Network, where you get the flawed, human side of an icon. I’d suggest that the difference between the carefully manipulated fabrication of a public persona vs. the actual reality is a more shocking dichotomy with Jobs than with Mark Zuckerberg. I just saw this the other day. Fascinating movie. Probably my favorite documentary of the year, behind Kurt Cobain: Montage of Heck. Oh I’d really like to see that one too. It’s my favorite film of the year. But avoid the other documentary they made about Kurt – Soaked in Bleach. It’s not that great. High praise. Guess maybe I should watch this. Had it scratched off my list. So far, the best documentary I’ve seen this year. I find your reviews to match my own opinions so I’m feeling like I might be surprised by this one. I love how Gibney opened more of the “brutal” window in the mind of Jobs. I suppose this information is already out there. But I give Gibney credit for presenting it in this form. I guess I’m just going to have to settle for the movie everyone and their sister is going to see this fall, the Danny Boyle feature film. I’ve been sort of tracking the progress of this film and in each review I’ve read the tone and praise gets more and more positive. Damn. This should serve as a nice comparison/introduction to Danny Boyle’s film. It’s On-Demand so thankfully it’s readily available. Oh that’s great news. Will look out for it then. Very interesting doc. Didn’t know much about Steve Jobs. Looking forward to the Fassbender movie now. 4 stars. Director: Danny Boyle, Writer:	Aaron Sorkin, Producer: Scott Rudin. Oh man I can’t wait for that. I’ve heard if you already know about Steve Jobs, there’s not much you can take away from this documentary, so I haven’t been in a rush to see it. Plus a friend of mine told he found the way Gibney personally inserted himself into the documentary to be annoying. From the sound of it, I’d probably agree. Maybe I’ll give this a shot at some point though. I thought I knew Jobs, but this documentary opened my eyes. The advantage of a documentary is that it gives you a look at the actual person rather than somebody impersonating him, so if you can see your way through the director’s filters and around his quirks, you get a better idea of what the subject was like than you do in a dramatizaton. I came away with the notion that Jobs had carried self-assurance to the verge of mania, which led to his failings at a personal level; but that he did put his sense of superiority to use in the talent the world knew him by best, which was promotion. He got Apple’s customers to think of themselves the way he thought of himself – above the common herd. When you produce a Mac or even if you just use one, you’re being a little like, umm … Bob Dylan? Albert Einstein? Martin Luther King? What I’m waiting for is the computer that makes you be like Mother Teresa.